At least that is what arts writer David Grant wrote last month in the Huffington Post. So, what else is new? Doesn’t everyone know by now that agriculture, architecture and even financial investments have taken up the banner? Maybe. But Grant went on to say that sustainability is so pervasive that it now has a foothold in the world of art. It appears that the palette of this phenomenon has gone somewhere over the rainbow. Locally, organizations on behalf of sustainable communities, such as the Joslyn Institute, do exist. But ever since the demise of the sorely missed Emerging Terrain–the progenitor of the marvelous Stored Potential that transformed grain elevators along I-80 from eyesore to eye-soaring art works—similar community endeavors with a strong sustainable arts component are hard to find. Bemis’ grandest experiment in sustainable art was the recent Mary Mattingly-designed Flock House Project: Omaha/A Citywide Workshop organized by its then new director Adam Price and his Consultant Curator Amanda Crowley. Though a strong indicator of the venue’s progressive and controversial new direction for its vaunted residency program as well as its events and exhibition schedule, ironically, both Price and Crowley unexpectedly left two years after its launch. UCA also struck gold with the understated, very creative Stochastic by Andrew Johnson, an artist and engineer, whose mixed media work integrates art, and science, for a better balanced, more efficient environment. “Social adventure,” “civic engagement” and “environmental balance,” they among others are the catch phrases of sustainable art. They may catch in the throat of some who wonder still what they have to do with art on the walls. Yet, while we may debate the efficacy, let alone appreciation of an art form that elevates concept and motive over object and style, we can’t deny its existence or impact. To continue the conversation, Reader asked several artists, arts educators and administrators in the Metro to comment on the relevancy of sustainable art in their careers and their venues. It should be noted that the artists below are known for their object-oriented work as well. And for some, understandably, art itself is not immune to issues of sustainability as they, their art and their institutions struggle to remain viable. Reader: Can art cause or at least encourage social, ecological and economic sustainability? Is that really part of visual arts’ mission or is it just a passing fad…again…or does it have sustainability as well? Susan Thomas, Director of the Omaha Creative Institute: I wouldn’t say sustainability is a passing fad. Our world is increasingly aware of our resource limits and sensitive to ways to sustain what we have as much as possible. Artists tend to be on the leading edge of social consciousness and that tendency is unlikely to dissipate. Paige Reitz, Program Manager for The Union for Contemporary Art: We firmly believe in the sustainability of art and artists’ power to create and encourage social change. Every artist we work with–even if their own personal practice does not specifically address or respond to social issues–becomes an agent for change by working within the North Omaha community and dedicating a set amount of service hours towards improving the neighborhood. Alex Priest, Exhibition Manager, Bemis Center for Contemporary Arts: Sure it can. But is that the role of visual art? Maybe. At the Bemis Center we think more about the artist’s intention, which at times may be to raise awareness about social, ecological, or economic issues, such as in the case of Mary Mattingly’s 2014 Flock House project. Jody Boyer, New media and mixed media artist and educator: Art absolutely can encourage sustainability. Though I think this is a complex issue; first, there is artwork that is made to create a dialogue around an issue of sustainability, and we see a great deal of that kind of work being made from material re-use, to urban farming as art, to creating alternate forms of economic exchange. Susan Knight, Installation and mixed media artist: In as much as art is a mirror to community and culture, art is driven by community and culture. Certainly, there is heightened interest in sustainability driven by the media and by groups of folks who fee the strain of digital information, or a reaction to dystopian concerns. Jamie Burmeister, New and Multimedia Artist: When I think of sustainability I think of survival. Making art always affects sustainability just as all our other activities do. Since artists often quickly react to societal changes, art often deals with new issues before these ideas find their way into the mainstream. Artists have always had to be very efficient with their making so they can have a sustainable art practice. Reader: How have the issues of sustainability affected or impacted your work? Can you describe a specific art work, project or program that you or your venue have created or participated in that successfully accomplished this? Thomas: One of Omaha Creative Institute’s most successful initiatives was the public art project Play Me, I’m Yours, which was on the streets in late summer 2013. The sustainability goal was to use gifted pianos as a canvas to share visual art, music and other performing arts in broadly accessible venues. Rather than dump the pianos when the project ended, we identified non-profits whose clients could enjoy a piano as a piece of visual (or street) art if the piano was unable to hold a tune or as a working piece of art. Reitz: We work to impact the sustainability of Omaha’s artist class by providing local artists space to create, professional development, a community support system, and financial support through our Fellowship Program. We teach environmental sustainability to North Omaha youth who engage in our Youth Outreach program by giving them hands-on experiences in our Abundance Garden and working with them from seed to harvest, engaging them in our own organization’s practice of material re-use and composting, and providing EcoArts classes with local artists whose own work takes sustainability into consideration. Priest: We have dedicated space in our building for leftover materials; it is like a giant thrift store where items unused by artists during their three-month residency can be left for use by the next cohort of artists. Our artists-in-residence continue to help us think of new ways that we can reduce waste and at the same time contribute to their processes of experimentation. Another example is the recent fermentation series led by two Bemis artists-in-residence, Leila Nadir and Cary Peppermint, where audiences discussed the industrial food system and learned about fermentation as a practice of food independence. Knight: Most sustainability discussions lead back to water. So it is always in my work. Presently I’m creating components for an installation at the Garrison Art Center in Garrison NY on the Hudson. The Hudson River Watershed, one of many watersheds in the state of New York is my concern and inspiration. Disparate factions, industry, agriculture, recreation and households must share the water. It requires respect for water and for one another. A map of any watershed looks like a map of our own vascular system, our veins and arteries. What impurities travel from soils into a tiny creek have potential to effect large communities downstream. We are all connected in that respect. Burmeister: I grew up in a rural environment where sustainability was always a part of your decision making process. We found ways to make a good life from what was around us. We live in a solar heated house. I now live a more suburban life but use these same principles in my art making and living. One piece in particular that deals with sustainability is “Cli-mac-ter-ic”. Time Guthrie and and I completed this 4 channel interactive video installation in 2011. The piece was shown at PUSH gallery on Vinton Street and at the Creighton University Art Gallery. Guthrie: “Elements – An Environmental Art Exhibit,” Fontenelle Forest, Bellevue, NE [Director: JD Hutton] This invitational exhibit was a seven-person show where environmental site-specific work was installed in the forest for a three-month public outdoor exhibition. My work was in three parts: Video, virtual, and forest installation. I wanted my piece to exist only virtually online and as geocached points placed in the forest, but at the last minute created a physical piece at the request of the organizers. I simply grabbed fallen trees and hung them in the area where they were found, but they created a “scar” in the land when viewed from a particular angle. 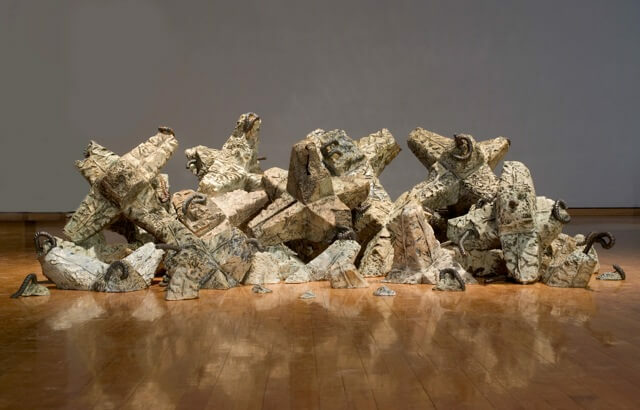 Jess Benjamin (Sculptor and Lied Gallery Director, Creighton University): My artwork focuses on water usage in the Great Plains area: a regional concern that is related to the phenomenon of global drought. Since 2000, I have witnessed the drought-like conditions in the Midwest, and I have witnessed how people have responded to the drought. My ceramic artworks reference the increasing struggles over water rights and are battered reminders of these problems. Reader: Aside from any art considerations, what special challenges do you or your institution face with regard to sustainability issues in general? How are you meeting those challenges? Reitz: With any art facility there is the ever-present challenge of handling and using materials that are not environmentally sustainable and many times we must concede our ethics to a medium. But, we try to combat these problems when they come up with the least-harmful solution. For example, to run our Print Shop we must have emulsion remover. Emulsion remover is terribly toxic and costs a lot of money, and so we found that if we took on a higher up-front cost of providing a dip tank for our Print Shop users that allows hundreds of screen dips into the emulsion tank rather than each screen being sprayed with emulsion remover individually, so that we would come out ahead both sustainability-wise and budget-wise. Knight: Since my work with water began I am more aware of my artist materials. The amount of toxic materials in my studio has decreased. I have respect for artists who use recycle/reclaimed products in their practice. I’m actively looking for ways that I might be more green about my artistic practice and products. Burmeister: To help make my practice more sustainable I have been shifting to make fewer objects but with higher quality. Quality over quantity, better material constructed in a thoughtful way will allow each piece to have a greater impact with less negative impact on our environment. I have also made the shift to simpler pieces that require less maintenance. Guthrie: With the new Sustainability Program at Creighton, it seems the university is interested in the subject, and they are doing things like installing solar panels, but there isn’t nearly as much happening as I would like to see. I have been 3D printing for a few years, and I was frustrated at the waste and started researching printers that could reuse support material, etc. The printer I recently proposed to Creighton should be on campus in a couple of weeks and my sabbatical proposal revolves around that technology. Reader: What will be the role of artists in the future with regard to sustainability? How will artists contribute to a greener, fairer, more equitable society? Boyer: Artists are natural innovators. As we struggle with the complex issues of climate change, world poverty, world hunger and globalization artists can help us find ways to engage in dialogue or think differently about available resources so we can work to solve and find ways to adapt to the needs of the planet, of each other. Guthrie: I really do think the best art addresses the times in which the artist live. That doesn’t mean art has to have a social justice component, but visual styles aren’t the only things that change over time. But, to be honest, I love that art can change the world for the better. Not just in a silly feel-good sort of way, but in a substantive way. My work may never achieve that, but I will keep striving for that goal. Knight: A greener, fairer, more suitable society will exist when we convert our vertical patriarchal society into a horizontal matriarchal society. How’s that going to happen you ask? Magic perhaps. Short of that I think elevating the concept of respect and instilling it into our lives and work and work practices will be a first baby step.